U.S. markets contended with the threat of an escalation in the Syrian War last week. As of Saturday, threats of missile strikes turned into actual missile strikes. We’ll see how markets respond on Monday. For now, we’re still in a downtrend, but price action did improve last week. 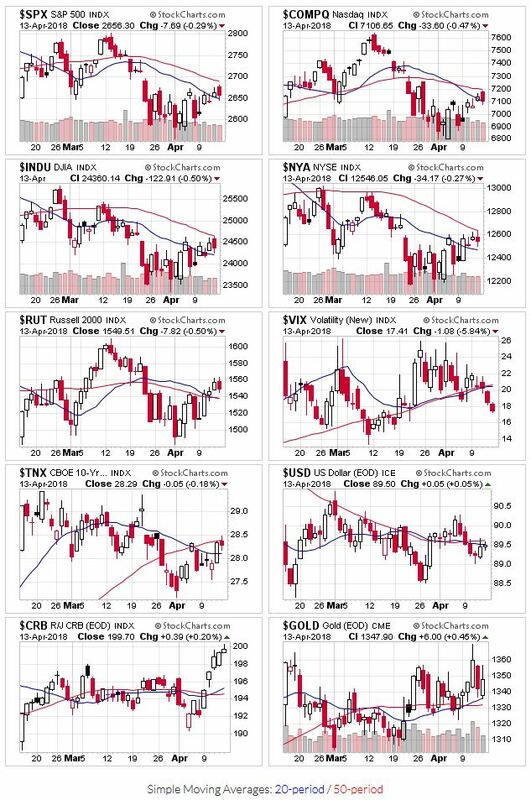 For now, all the indexes regained their 20-day moving averages, but most are below their 50 day moving averages. The only exception is the Russell 2000, which begins the week above it’s 50 day moving average. Price and volume action remains downtrend territory. We didn’t add any distribution days to the count, but trading volume declined as prices rose (not a good sign). OEW analysis continues to indicate that the current downtrend may have bottomed, but price action remains choppy and hasn’t given the all clear yet. From a technical standpoint, the S&P starts this week on better footing than last week. 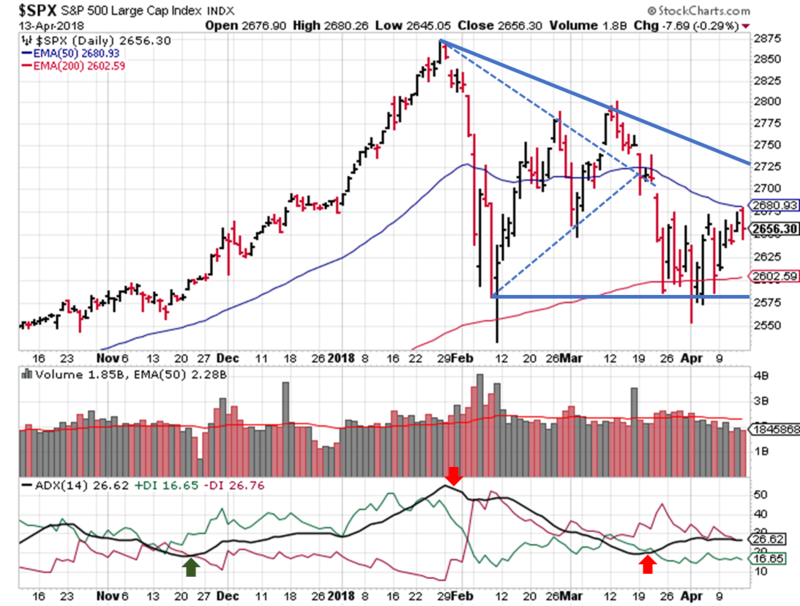 The S&P found support at the bottom of the descending triangle pattern, and is now looking to cross the 50-day moving average. The pattern’s floor remains at 2581; the upper trendline now sits at 2725, give or take. The ADX indicator is basically unchanged from last week; the DI- remains higher than the DI+ (bearish), and the ADX line is flat. 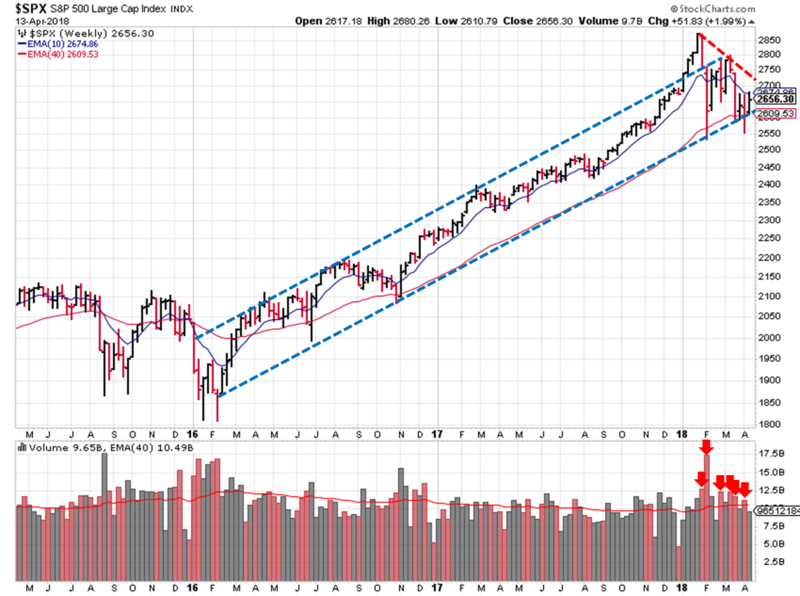 Moving to the weekly view, the S&P500 bounced off the price channels lower trendline during the week.